This is an excellent late season nymph. It represents Hexagenia, Light Hendrickson, March Brown and some small stonefly nymphs. The eyes may start to come off but keep this pattern tied to your tippet as it will continue to catch steelies. Spawning brown trout & salmon (fall) as well as steelhead (spring) dislodge plenty of nymphs as they dig their redds. Consider fishing the following nymph patterns downstream of active redds. Many times you will find resting steelhead in the 1st dark water pockets below these active redds. The key to this pattern in my opinion is it’s simplicity. The Pincherry nymph simulates a lot of mayfly nymphs probably some caddis larva as well. This fly fools stale steelhead; that is the true test. The green body is one reason the fly is so attractive to steelhead, almost all of the western Lake Superior tributaries have good Baetis and caddis populations. Pteronarcys stone fly nymphs are the silver bullet for the “savvy” live bait fishermen that prowl the Brule. Fly anglers can imitate these huge nymphs. This pattern is very easy and quick to tie. The Pteronarcys of Lake Superiors’ South shore rivers are available to the steelhead 365 days a year. They are huge when mature, a true size 2. You should capture and release a few to check the color and to see how active they are. Look for pine knots along the edge of the river; look upstream of hwy FF all the way to the extreme upper river. Grab the pine knot which can be 1ft - 5 ft long and turn it slowly. Look in the knot holes themselves as well as the large cracks in the wood. You will usually see 1 or 2 nymphs per piece of wood. They are fierce, look out! They will grab your finger and hang on with their legs or drop into the water right away. Observe their color, their size and anatomy then put them back on to their piece of wood and slowly place the wood back into the river near the bank. Fish this nymph almost anytime, especially if the fish have been holding in deep holes due to low clear water. This pattern is good any time, the movement of the rabbit strip is the key. Leave a tail of rabbit coming of the bend of the hook and check it fairly often to see if it has fouled around the hook bend. Fish this fly in deep tail outs, bodies of deep holes, and heads of big holes. Zonkers fish best (deep) in medium speed currents. Also strip this fly through slow deep tail outs and slow holes. When tied in cherise (hot pink) this fly is a good coho salmon pattern. This pattern does not fish well at the steelhead level in short, fast water pockets. Also, fish that are locked into spawning and very shallow will often turn and swim away from a black zonker. 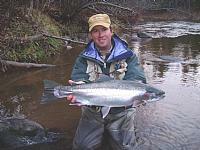 This is the best all around year round pattern for our western Lake Superior steelhead. It catches fresh run, stale and spawned out fish. There are times when a properly presented nymph will out fish a glo bug, this mainly occurs when fish are stale and water visibility is clear. The key to the glo bug for fresh run fish is the curiosity and excitement that a colorful egg patern generates. Fresh silver steelhead love cherise or baby pink and chartruse is just as effective. The fish will move a good distance to grab this fly but won’t hit it hard, they just inhale it. They seem to know that an egg can’t swim away. Late season steelhead love to eat eggs too. In the spring there are a lot of steelhead and sucker eggs around gravel bars and in the fall there are Chinook,coho and pink salmon as well as brown trout eggs. In the late season of spring or fall tie your glo bugs small and tight; in o. cheese or orange and no larger than a pea.